​After 5 years, CT Cover Creations finally decided to re-brand with an all new logo! It truly was a huge dilemma whether to do this or not but after a long debate I had in my head for months, I decided that it's time to do it and I have to say that I'm more than happy with how it turned out. It might take a while for people to get used to it but I believe it's for the best. What do you guys think? Do you prefer it over my old logo? I have to give special thanks to my brother for making CT's new logo for me! JABBIC 2017 - We Did It Again! Hey everyone! Yes, yes. I know. This is a long overdue post. I'm so sorry! I'm going to say I've been busy but then I think all of you know that already. Besides being busy, I blame the headaches. If we're connected on Facebook or you're following me, you'll know this. Well truth is, with how things went with JABBIC 2017, I'm lost for words to describe how I felt when they announced the winners. Happy is an understatement. Honoured - it's probably the best description. 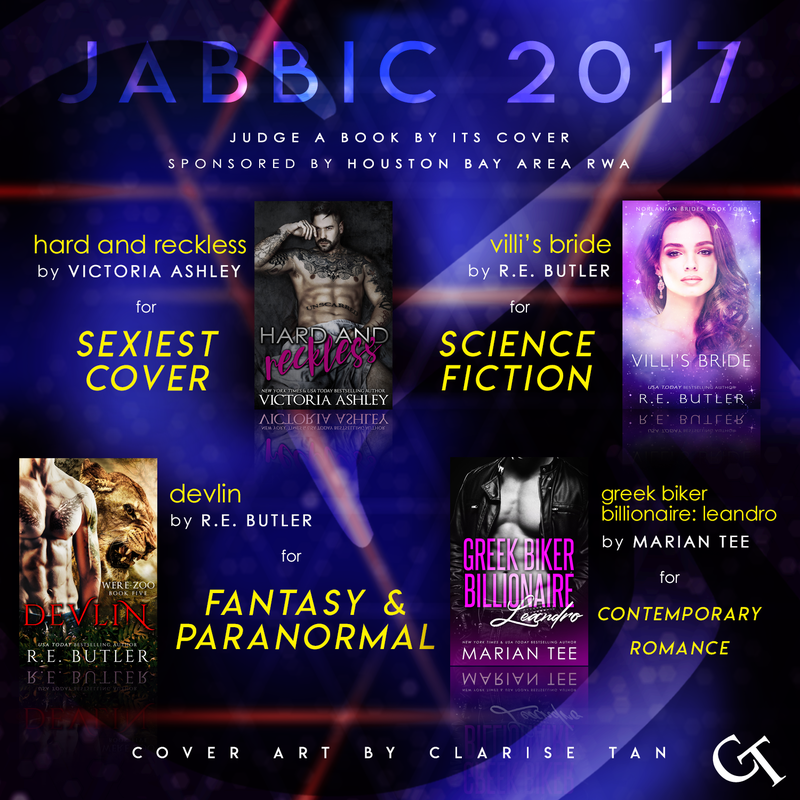 For the past 4 years, I've been part of JABBIC along with some of the most talented authors I had the pleasure of working with. To name them, they're are R.E. butler, Marian Tee, and Victoria Ashley. Every year, we're so blessed to always have a cover win something and this year, it's probably the most special of all. This year, we have 3 covers that won their categories. ​You might be wondering what makes this year extra special. It's not the number of covers that won but it's the category. Being able to win something in the Grand Prize category is something I never thought would happen. This is a first for me. Until now, it still feels surreal. With Reader's Choice, we know that it's all thanks to the readers for helping us vote. We wouldn't win if it weren't for them. 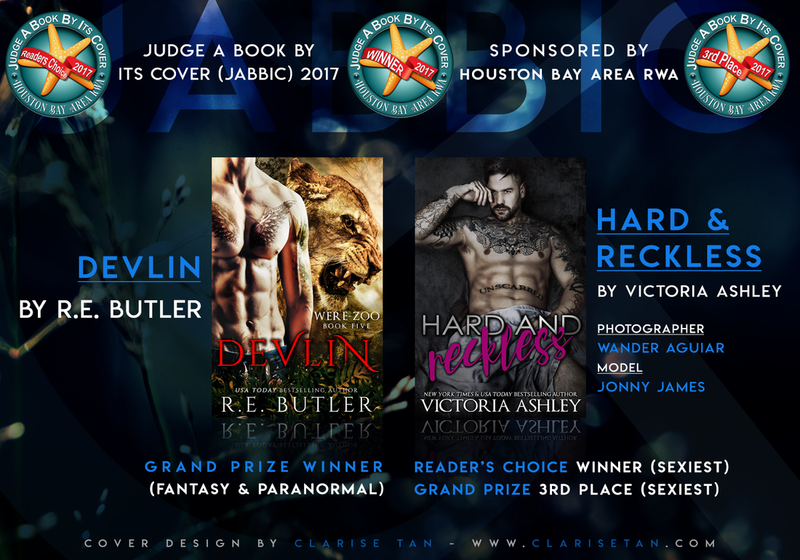 But with the Grand Prize, it's the judges who gets to choose which cover they liked best so knowing that, it makes me so happy. Being part of JABBIC every year is such a huge honor for me. Not only because I get to join with some of my great author friends but also because I get to be part of something that involves so many great designers all over the world. Some of them are even designers that I look up to, people that inspire me. For someone like me, it truly is an honour. 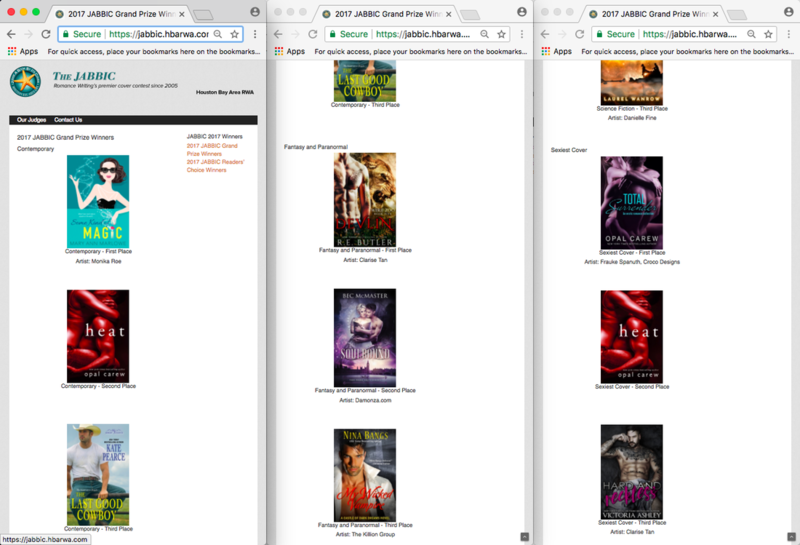 To Houston Bay Area RWA, thank you for this yearly event/contest wherein book covers - written by different authors, designed by different artists all around the world - are gathered in one place. To the readers, thank you. I don't know what we'll do without you. 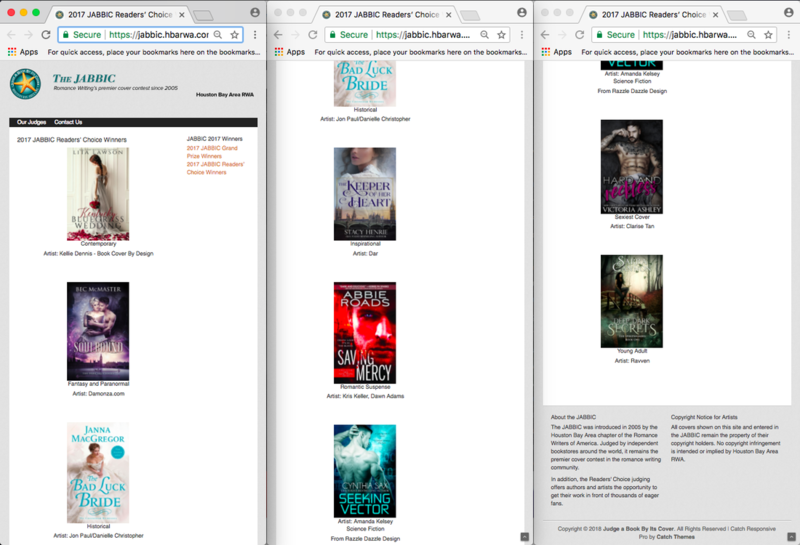 Thank you for helping us vote for your favorite author and their books. Know that we appreciate every single vote you made. We won't be here if it weren't for your love and support. Again, thank YOU! To the authors, I can't think of words to express how grateful I am to each one of you. Whether you're still working with me or not, thank you. Thank you for giving me the chance, for trusting me with your book, for recommending me to your friends, and most especially, for the friendship. Know that I always appreciate you. I won't be doing this for so long if it weren't for you so thank YOU! To the photographers and models, I may not always be in direct contact with you but believe me when I tell you that I'm grateful for getting the chance to work with you and your art. Whenever I work on your photos, I always pressure myself to do my best to give justice to how gorgeous your works are. They're such work of art and I wouldn't want to do something that would ruin it. Know that, I appreciate it whenever you share your thoughts(about the cover) with me. You have no idea how much it means to me. To everyone else, thank you. Thank you for helping us vote every year. Thank you for being around to support us and our art. We truly appreciate it! JABBIC 2017 - HERE WE GO AGAIN! Hey you guys, look what time it is! Yes, you got it right! We're part of Judge A Book By Its Cover(JABBIC) once again! It's always such an honor to be part of this yearly contest with so many talented cover designers all over the world! 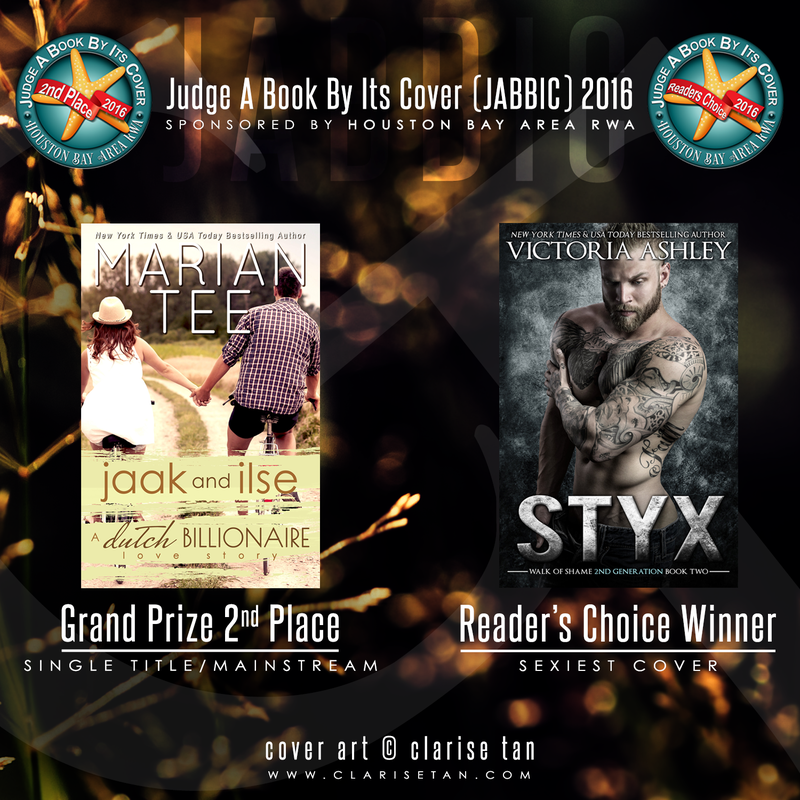 This year, it's already the 4th year of CT Cover Creations to join the said book cover contest and like the previous years, here I am again asking for your help to vote for our entries this year. I'm not asking just for myself but also for these amazing and talented authors I had the pleasure of meeting in this industry. If you think that the covers are good enough, it's nothing compared to how great these stories are! We'd really appreciate every single vote. The vote links are listed below and don't forget to rate the book 5 stars. Feel free to share it with your friends too! ​Thank you so much! Wherever we are now, we owe it to our readers so thank YOU! Thank you for supporting us and our art. We'll keep striving to better ourselves in our crafts to give you better stories and cover to enjoy.